Self Cure Remedy details of Apply St. John's wort oil for the care and relief of Bee Sting, including effectiveness and popularity scores of the remedy. 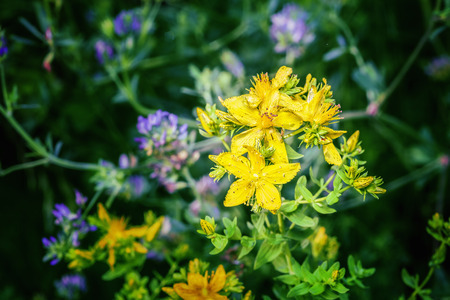 St. John's wort oil can reduce pain, swelling and the burning sensation after a bee or wasp sting. Mix the St. John's wort oil with some bentonite clay then apply the paste to the affected area. If you don't have bentonite clay you can just add a few drop of the oil to a warm, wet cloth and put that on the area. The self cure remedy of Apply St. John's wort oil for the care and relief of Bee Sting has an effectiveness score of 2.5 and a popularity score of 3 on the self-cure system.